EATONTOWN, N.J. (January 24, 2017) – Circle BMW, the region’s premier BMW dealership, today announced that Thomas J. DeFelice, III, vice president and general counsel, Circle BMW, has graduated from the Dealer Candidate Academy at the National Automobile Dealers Association (NADA) in Tysons, Virginia. The Academy is an eleven-month educational program that consists of six classroom sessions, each one week in length, combined with 40 weeks of in-dealership analysis provided by the sponsoring dealership. Classroom instruction is structured in a manner that allows for introduction, analysis, and strategic business planning for operational success of the various profit centers within an automotive dealership. While attending graduate school, college and high school, DeFelice periodically worked at Circle BMW in various departments. He rejoined Circle BMW on a full time basis in 2015 as the dealership’s new Vice President and General Counsel. In his current position, DeFelice is responsible for managing the daily operations of the dealership. Prior to Circle BMW, DeFelice was an associate at the law firm of Landman, Corsi, Ballaine & Ford, P.C. in Newark, N.J. from September 2013 to August 2015. DeFelice served as a judicial clerk to the Honorable Sebastian P. Lombardi, J.S.C, Superior Court of N.J., Law Division, Civil Part, Newark, from August 2012 to August 2013. DeFelice is a graduate of Seton Hall University School of Law where he received a J.D. degree in 2012. He earned an M.B.A. from Monmouth University’s School of Business in 2009 and a B.A. in Economics from Boston College in 2008. He is also a graduate of Christian Brothers Academy (CBA) in Lincroft, N.J.
DeFelice is a member of the CBA Alumni Committee, volunteers his time for Catholic Charities and is on the NJ Car Next Generation Board. Circle BMW, owned and operated by Tom DeFelice since 1981, and recently joined by his son Thomas J. DeFelice, III, is dedicated to excellence in all phases of the BMW ownership experience: sales, service, parts, accessories, lifestyle products and lifetime customer support. Serving customers in Central New Jersey, Circle BMW is one of the tri-state area’s leading luxury automotive dealerships and a four-time recipient of the prestigious BMW Center of Excellence Award for achieving outstanding levels of performance and customer service. In addition to new vehicles, Circle BMW offers Certified Pre-Owned vehicles that meet demanding standards for resale. Our award-winning Service Department is among the top in the nation and is proud to employ the largest staff of BMW Master Technicians in New Jersey. Circle BMW is one of the largest BMW authorized stocking dealers of original equipment parts and accessories in the region. Learn more at circlebmw.com and connect with us on Facebook.com/CircleBMW,Twitter.com/circlebmwsales, Instagram/CircleBMW and YouTube.com/circlebmw. 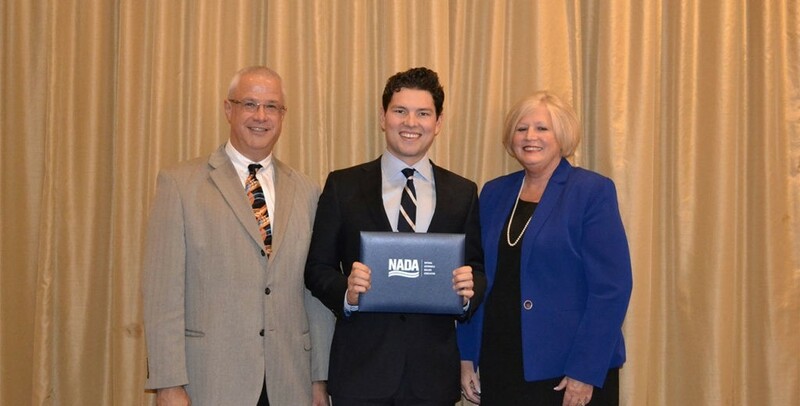 Circle BMW Vice President and General Counsel, Thomas J. DeFelice, III, recently graduated from the Dealer Candidate Academy at the National Automobile Dealers Association (NADA) in Tysons, Virginia. Pictured with DeFelice (center) is Allen Phibbs, director, NADA 20-Group and Academy (left) and Diane Sauer, 2016 Time Dealer of the Year (right).